October 18. 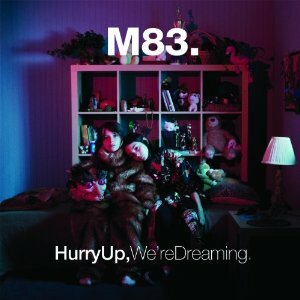 2011 | By Valerie C.
Three years in the making, Anthony Gonzalez (aka M83) is ready for all of us to analyze his dream(s). His latest, aptly titled Hurry Up, We’re Dreaming is an ambitious double LP and double LP’s can sometimes be a double-edged sword. Does the Los Angeles transplant via France deliver? Indeed. And does so beautifully. “Intro,” which features Zola Jesus, is a scrumptious appetizer that at times feels weightless, anchored only by the vocals. It sets the tone for the rest of the album. The album is littered with DJ/club-friendly tracks like “Midnight City” and “Reunion.” And those dance-friendly ditties are appreciated, but it’s all about the deep cuts baby, like the acoustic-guitar heavy “Wait” and its steady crescendo build-up made more powerful by the backing of choir-like vocals. “I’ll be yours, someday” laments Gonzalez over and over in the mesmerizing, orchestral track “Soon, My Friend.” Electro-poppy “New Map” is blissful and the addition of wind instruments near the end shows M83’s increasing inclusion of traditional instruments into their repertoire. The innocence of childlike wonder is encapsulated in a child’s narration about frogs and friends in the charming “Raconte-Moi Une Histoire.” Depending upon ones current mood/state of mind, listening to Hurry Up, We’re Dreaming can feel like a long abstract dream and at other times like individual dream vignettes. What lovely, joyful dreams. So, what are you waiting for? Hurry up and add M83’s Hurry Up, We’re Dreaming to your record collection. But for cripes sake, slow down and absorb it all. Take it in. Marinate in its juices. There’s no hurry. You’ve got all the time in the world.